When Rosemary was just five, she lost her twin sister, Fern. Her mother collapsed into a deep depression. Her older brother Lowell spent more and more days away from home until he finally ran away. Her father never talked about Fern. As a college student, Rosemary is still struggling with the loss- trying to figure out who she is, and how she relates to people. Fern, tho, was not really Rosemary’s sister. Fern was a chimpanzee, and the girls- one human, one primate- were raised together as part of her father’s research. The story about the girl and the chimpanzee is good. It raises some tough questions about human research on animals, and what it means to be human. But there are more layers to this book than just narrative. We Are All asks big questions about language, meaning and communication. Did Fern learn to speak to humans, or did Rosemary learn to speak like a chimp? As a research subject, Rosemary’s voluble speech was interesting; without Fern, no one cared as much. In time she left more and more unsaid. We Are All also brings up questions about family: what makes a family? What becomes of a family when members are taken away or leave? What do we owe to our siblings? The ending (no spoilers here) is hopeful, if not exactly happy. It doesn’t seem to matter which language is spoken- human or chimpanzee- as long as we are communicating. In the end, our family are the ones who we can recognize as “same”- our red poker chips. 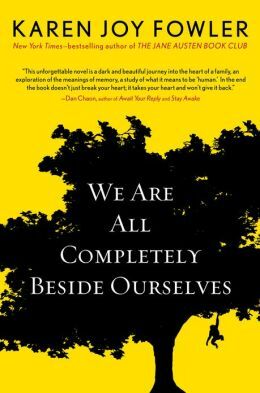 This entry was posted in Fiction and tagged book review, chimpanzee, communication, family, fiction, mirror self, siblings, twins. Bookmark the permalink.